On the ever cold lookout for new means of communication with people, marketers have been huddling around the fire that is push notifications; of late, web push notifications. Web notifications have gained plenty of traction simply by being new in the marketing sphere. What bits of them do really work for you running an e-commerce website? There’s the proverbial ‘plenty’ but the simplicity of this nascent means cuts short the long talk about the how and why of web push notifications. With the shifting of the city square shops to the online space, e-commerce websites need to utilise a variety of means to attract and retain customers on a daily basis. If you’re an owner of such a venture, you would know the pain of crafting and implementing such strategies to garner and maintain visitors that convert to viable consumers who form a loyal base. These strategies involve a complex mix of analytics, observation, and implementation through means like email, SMS, newsletter outreach, mobile applications and what not. Web notifications fit the bill for all of this while avoiding the caveats of the aforementioned methods, making it the perfect candidate for your e-commerce marketing. So what DOES make web push notifications so distinct from other means of apprising customers about the latest of your breakthroughs and offers? Mobile apps are great. Sure, but they need to be installed first and are limited to the platform that they are installed on, not to forget the limitations of the application store they are hosted on; emails are plagued with spam and poor open rates; SMSes have a text & platform limitation while suffering from, yet again, spam. Web push notifications are available across platforms which can’t be said for all other current means of marketing. They do not require the user to be on your website for functioning either, which is great news for e-commerce websites. It’s hard to send across actionable information like order delivery details, offer coupons, and sales to customers through emails which have low open rates or are opened way too late to be of any use. This is why push notifications are better than emails. With the majority of users spending their time surfing the web on browsers, people have found it easier to hop from site to site than to visit particular apps and keep checking their e-mails; prime time for utilising the web push notification potential. Web push notifications are across all devices that have web browsers including mobile, tablets, & personal computers; an incredibly powerful tool for delivering real-time, time sensitive data and notifications to the user across all platforms, without earning the tags of ‘obnoxious’ and ‘clingy’. 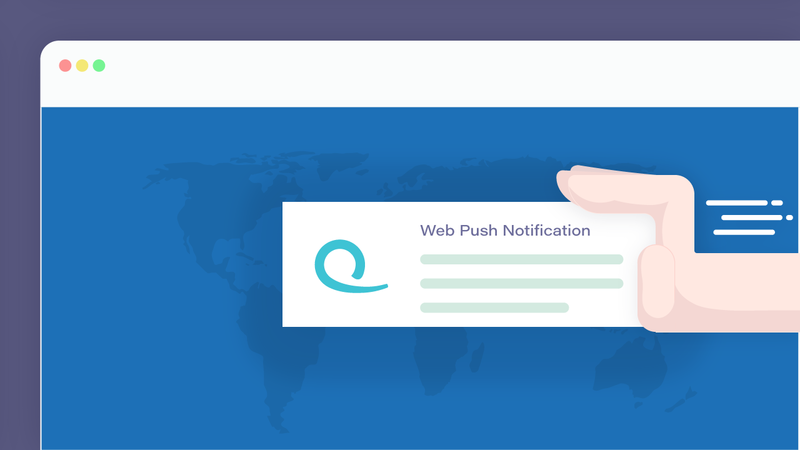 The apparent limitlessness of push web notifications makes it a medium of unprecedented outreach; its jewel being the ability to send notifications to users without having them to be on your website. E-commerce stands to benefit the most out of this owing to the industry’s nature. Web push notifications work on the principle of ‘user consent’ rather than the ‘in your face’ approach that many app notifications, email newsletters might end up having. I know, I know, marketing has all been about making the experience of the user more and more personal. Nonetheless, lately, e-commerce marketing has specifically, and otherwise, carried the notion of ‘intrusion’. Pop-ups demand your details, email lists keep piling up with unsolicited mails, notifications that you don’t ask for keep sliding into view; web push notifications eliminate this aspect entirely. They work only after the user has allowed the pop-up notification on a website to send them heads up from the concerned website. Since they do not ask users for their personal details – name, email ID, birth date, social security numbers if they’re completely phoney – and merely their consent, web push notifications have higher opt-in rate amongst users. They are easy to opt-out too, although should be making sure to not let that happen. So you have nailed the best strategy for selling your product through the online medium. You decide to run an email campaign for a huge sale that’s to last for a day. You wait, and barely get a response through poor email open rates and worse click throughs. Web push notifications are great for strategies contrived and implemented on the run. New implementations on your website are intimated to the user on the fly. That new limited time sale you were planning? Web push notifications it is. No hassle of opening a pre-customised mail that perhaps doesn’t even fit your needs. You can deliver real-time information to customer about their order delivery times, new sales, discounts, offer coupons, new products and what not. Since all the information is delivered in real-time, you needn’t worry about people not knowing of your limited time sale. Be a little wary when it comes to time sensitive events, though. You don’t want your customers to be clicking on that juicy 50% sale on cat mittens only to find that they are late. Set an expiry for push notifications that are time sensitive, otherwise you might frustrate, or worse, drive away customers. Provided you’re’ using the right tool for implementing web push notifications on your website, you can customise what you want to send to your viewers. You don’t want to be sending the same dismal message to all of your users time and again. It is a good strategy to have analytics in place to track and monitor the behaviour preferences of your users and take action accordingly. Apps like Notifyfox offer features that allow you schedule and customize the notifications that you send based on the user’s location, their behavior, preference, et al. A wide array of such options to tweak allows web push notifications to be a more effective tool than an email or an SMS. You can personalise notifications according to the users’ needs, show them new product catalogs & relevant discounts if they have been purchasing more from a particular category. You can give notifications about items pending purchase in checkout carts that buyers might have forgotten about, a change in prices of the items in their wishlist. This even helps you cater to the right conditions like time zones, seasons of the year and even weather, lest you be sending great summer tunic offers at night to someone living through the Siberian winters. You don’t want to send the right message at the wrong time. Sure, web push notifications haven’t yet lived thebanner blindness, but you still have to take care in what you offer to the user. Even though the opt-in for push notifications is a consent-based pop-up, some people might accidentally click ‘allow’. It’s much better to include a 2 click opt-in, the first asking the user’s permission to allow the notifications and the second to add them to the subscriber’s list, instead of having them accidentally click the ‘allow’ button only to fume at your website’s notifications. . This helps you get rid of false metrics which is crucial in implementing the right strategy, and is also less annoying for the average user who is already plagued. Who knows, it might just net you that almost accidental user. Even post opt-ins, be sure to not bombard your users with notifications. This WILL make them go away. You have to do the gool ‘ol hit and trial to see what is the best frequency for what groups of users, but it is a good idea to send around 1 a day, and perhaps steer very clear of the 1-every-hour territory. Maintain a clear message that brooks no confusion or question and gives the reader an understandable and direct message. Remember that the use of a web push notification is to engage the user, to make them click the pop-up. Make distinct and targeted copy that converts the intended message that prompts action on part of the user. It’s a good idea to include a sense of urgency to your notification. Humans as such are more concerned about potential losses than gains. Make that sale a limited time offer, show dwindling stocks and numbers indicating purchases already made of the good shown; incite urgency. Web push notifications have a significantly larger advantage for your e-commerce enterprise than other marketing strategies. Push notifications are growing out of their niche to become widely accepted, and there won’t be a better time to start harnessing their utility. As much as they help you convert those leads and pump up your numbers in your analytics page, you have to take care of your customers too. Offer easy opt-outs, avoid spam, give discount for sign-ups if you have to, conduct surveys, and then test as much as you can. Staying up and aft in this break neck competition requires you to be ahead of the curve and web push notifications are the way to go. Still baffled with what web push notifications are about? Hit us in the comments with your queries. Better yet, give push notifications a try first. Notifyfox offers a free trial for upto 5000 subscribers; no strings attached.